MARCH 12TH: KNOX COUNTY RIGHT TO LIFE MEETING, at 7:00 p.m. at Mount Calvary Lutheran Church, 1372 W. Fremont St., Galesburg. For more information, call Mary N., 309-343-0621 or Pat C., 309-343-2852. MARCH 27TH: PRAYER WARRIORS spend one hour praying in front of the Whole Woman’s Health Abortion Facility at 7405 N. University in Peoria. For more information call Barbara, 309-388-0145. APRIL 9TH: KNOX COUNTY RIGHT TO LIFE MEETING, at 7:00 p.m. at First Church of the Nazarene, 1501 Webster St., Galesburg. For more information, call Mary N., 309-343-0621 or Pat C., 309-343-2852. 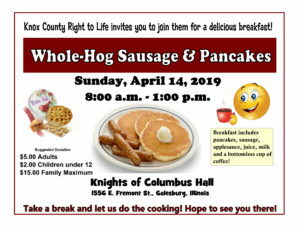 APRIL 14TH: ANNUAL WHOLE-HOG SAUSAGE/PANCAKE BREAKFAST AND BAKE SALE. Serving from 8 a.m. – 1:00 p.m. at the Knights of Columbus Hall, 1556 E. Fremont St., Galesburg. Tickets will be available at the door = $5.00 for adults/$2.00 for children under 12; $15 Family Maximum. APRIL 24TH: PRAYER WARRIORS spend one hour praying in front of the Whole Woman’s Health Abortion Facility at 7405 N. University in Peoria. For more information call Barbara, 309-388-0145. MAY 14TH: KNOX COUNTY RIGHT TO LIFE MEETING, at 7:00 p.m. at Bethel Baptist Church, 1196 N. Academy St., Galesburg. For more information call Mary N., 309-343-0621 or Pat C., 309-343-2852.